Having the right marketing strategy is a big part of any organization’s success. But without strong leaders and solid management processes in place, an organization would fall apart. That’s why we often cover topics that veer toward broader business management tips and best practices. What Percentage of Your Time is Spent on Strategy? Online marketing starts with your website. And so web design is a crucial part of marketing. While marketers should not be expected to be designers, they need to know enough about what makes design effective in order to set their companies up for success. 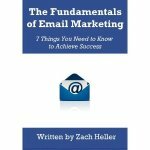 Email marketing is a topic covered frequently on this blog, and for good reason. It still holds the title of best return on investment for any marketing channel out there. Clickbait Subject Lines: Good or Bad?